It's easy for summer days to pass by without really accomplishing anything. And while it's fun to hang at the pool or binge a Netflix show every once in a while it also feels good to actually accomplish something. Obviously, a job is a great way to keep you busy, but I understand that's not possible for everyone or some of you may want to be productive in your time off from work(like me). So I think, summer is the perfect time to form a new habit or to start a new project. This summer I'm trying to get into the habit of exercising by running and doing yoga. I also want to create a scrapbook for my freshman year and get caught up on my reading list! Find something you want to start putting time into and then follow these tips to help you accomplish it. 1. Use a Planner: The best way to convince yourself to stay productive is simply to use your planner and make to-do lists of what you want to accomplish for the day. If you are like me there is something motivating about getting to cross through things on your to-do list. 2. Get in a Sleeping Habit: We all are going to have those summer days when we stay up way too late, but the majority of the time focus on going to bed at a reasonable time and also waking up at a good time. This will make sure you are well rested but also that you get going and get productive in the morning. 3. Give Yourself Time Off: Though some of the things you may want to do may be fun for you, make sure you still give yourself lazy days watching Netflix or time to enjoy a family vacation. You don't need to be productive all the time. 4. Do Different Things: Don't plan to spend your whole entire day doing the same thing because you'll get tired of it. Maybe spend the morning doing one thing and then switch to something else after lunch. 5. Still be Spontaneous and Have Fun: You may plan to spend your Tuesday working on something, but if your friend invites you to do something say yes! There will be plenty of other days to be productive, you should go and have fun when you have the chance. I hope these tips help you guys to make the most of your summer! It's great getting to list off the things you accomplished over the summer once you get back to school. 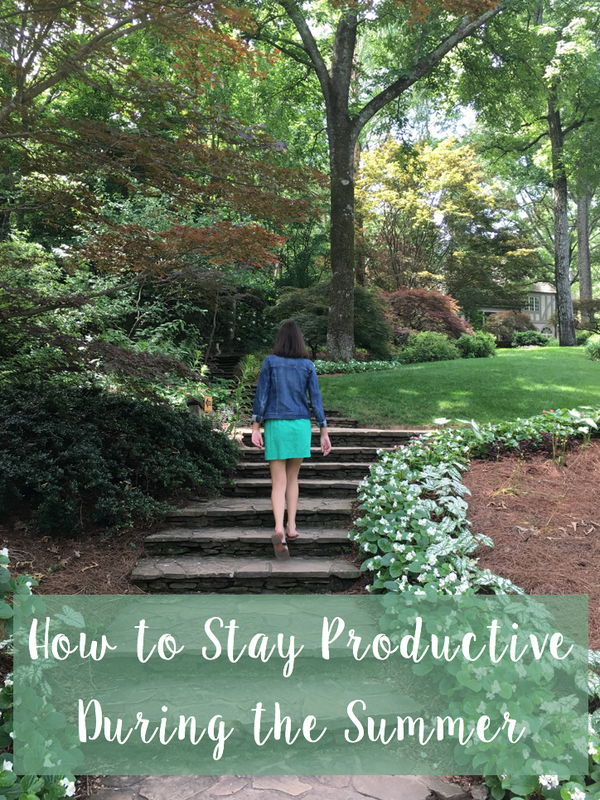 Let me know ow you plan to stay productive during the summer in the comments below! I've been doing much better about going to bed at the same time, it makes such a big difference especially during the summer! It really does! Especially because I love to be in a routine!